Mix a plan to eradicate blight with major investment, fold in one man’s dream for business growth and bake for two years. What recipe for the struggling south end of Mt. Airy’s commercial corridor could be sweeter? Little Jimmie’s Bakery Cafe is expanding to a second location across the street from its original location. Modeled after an old-fashioned bakery, Little Jimmie’s Bake House, 6614 Germantown Ave., is expected to open next month. Like the cafe, it will occupy one of Mt. Airy’s oldest existent buildings. Vacant for a decade, the property underwent more than two years of extensive renovations as part of a $1.3 million dollar revitalization effort led by community development corporation Mt. Airy USA. “It’s going to be a nice addition to the avenue. I’m real excited about it,” says owner Jimmie Reed. Little Jimmie’s Bakery Cafe opened in Dec. 2011 and quickly became a neighborhood favorite. Inside the historic one-room Beggarstown School House, food is prepared, stored and sold not only for the cafe’s customers, but for catering orders and a select few wholesale clients as well. Demand has increased so much over the past 18 months, that Reed has outgrown his original location. Opening a separate bakery was necessary in order to continue to grow the business. The plan for the Bake House has been in the works for two years, he said. Prior to that, Reed attempted a second restaurant venture, Poquito Jaime. The Tex-Mex eatery shuttered its doors within three months of opening, largely because he had not anticipated the demands of running both restaurants alone at the same time. His former business partner, and co-owner of Little Jimmie’s Bakery Cafe, Lora Little, unexpectedly severed their relationship just weeks before Poquito Jaime commenced business. Last February, Reed joined with coffee vendor, Jimmy Durand, to bring Little Jimmie’s Coffee Roasters to Germantown’s Maplewood Mall. That partnership also dissolved and the business closed in September. Reed says his main takeaway from those experiences is that he cannot depend on anyone but himself. “I can’t allow a partnership to help grow my business. I have to take full control of it,” he said. Once the Bake House opens, Reed will operate as general manager for both locations. He’s already put together a team made up of local hires: a restaurant lead for each site, a bread specialist and an apprentice baker will join his existing staff of four. Moving forward with the bakery will enable a long term vision of growing a brand around a central location, Reed said. With that, the company’s name has been changed to Little Jimmie’s Restaurant Group. Under that business umbrella are the Bakery Cafe, the Bake House and Little Jimmie’s Coffee Company. Reed will move coffee roasting to the new bakery. He hopes to one day open three more cafes in the region. The bakery’s takeout offerings will include 10 different cupcakes daily, ready-to-go cakes and pies, pastries and special orders. The five types of fresh baked breads that will be for sale will also be incorporated into the cafe’s menu for all sandwiches, Reed said. In addition, the bakery will sell eight different flavors of gelato, acquired through an off-site vendor. Seating will be very limited in the cozy 680 square foot space, but Reed plans to have several tables and chairs outside for sidewalk seating in warmer months. Though baked goods are sold in other Mt. Airy cafes and markets, the Bake House will be the first dedicated retail bakery shop in Mt. AIry in quite some time. The last known was Abram Engard’s bakery whose building was bought by Patrick McMenamin in 1942. Reed says MAUSA and the city’s Commerce Department have been instrumental in helping make the new neighborhood bakery a reality. 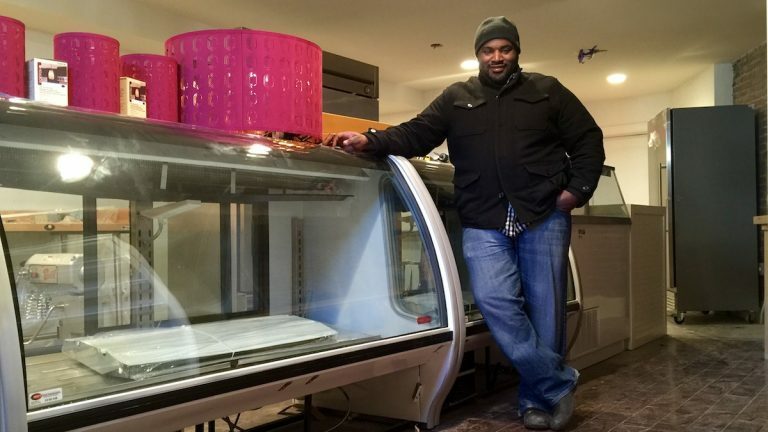 He received funding to help build a commercial kitchen on the premises through the city’s InStore forgivable loan program and a Kiva Zip Loan. One thing Reed wants to assure the community is that the original Bakery Cafe isn’t going anywhere. He has plans to build a separate colonial-style carriage house structure with an attached walkway behind the building, where a patio exists now. That addition will bring 35 additional seats to the cafe. He says keeping the cafe running regardless of what future enterprise he pursues is of utmost importance to him.